Dr. Chris Tsintolas creates a specialized treatment plan designed to best meet your individual needs. A variety of factors determine the type of treatment recommended. 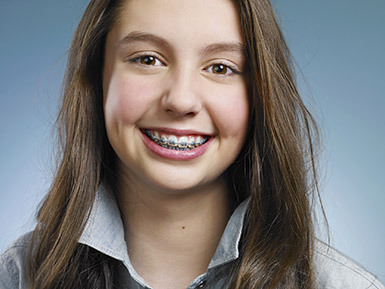 In-Ovation® R – Self-ligating brackets that offer a cleaner, more esthetic appearance. MicroArch® – Approximately 30 percent smaller than conventional brackets, the small size, rhomboid shape and smooth edges provide greater comfort and esthetics. Mini Diamond® Twin – A 30 percent reduction in overall bracket size improves esthetics and comfort. OmniArch® – A midsize bracket with a low profile and smooth finish that is comfortable and attractive. Damon® – Self-ligation technology designed with patient comfort and esthetics in mind. Ovation C® – – Translucent, stain-resistant ceramic that blends with tooth enamel. STb™ Light Lingual System – Braces that are fixed to the back of the teeth and are unnoticeable to others. Invisalign®, Invisalign Teen® – these are alignment systems that use a series of clear, plastic aligners to shift teeth into ideal position.